Gold Mine Road is a paved route that extends north into the hills. The Mine in Helena, Montana, went out of business a hundred years ago and was abandoned. And Joel Smith is the cocky, adventurous man without a plan. We all know what curiosity did to the cat though, right? On Memorial Day in 2000, Joel's reckless curiosity leads him into the abandoned mine. He emerges in May 1941, stuck in history and the age of swing dancing. It's a critical time in history—the draft and a nation drifting toward war. No matter what genre you prefer reading, everyone appreciates a good story. John A. Heldt is an author that weaves a tale, keeping you entertained until the end. I was invested in Joel's adventure, wondering if or when he would choose to return to the present. How he would adapt to his new (yet aged) surroundings. This isn't your ordinary time traveling book. It has its own pace and outcome. 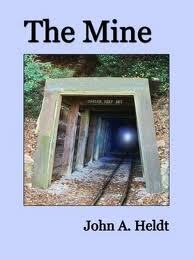 You can download the eBook version of The Mine for only $2.99. Small price to pay for a well told story. DISCLAIMER: This book was received directly from the author for review purposes only. In no way does it influence my review. The opinions I have expressed are my own.